What are the misspellings for lose? What are the common mistypes for lose? What is the definition of lose? What does the abbreviation lose mean? 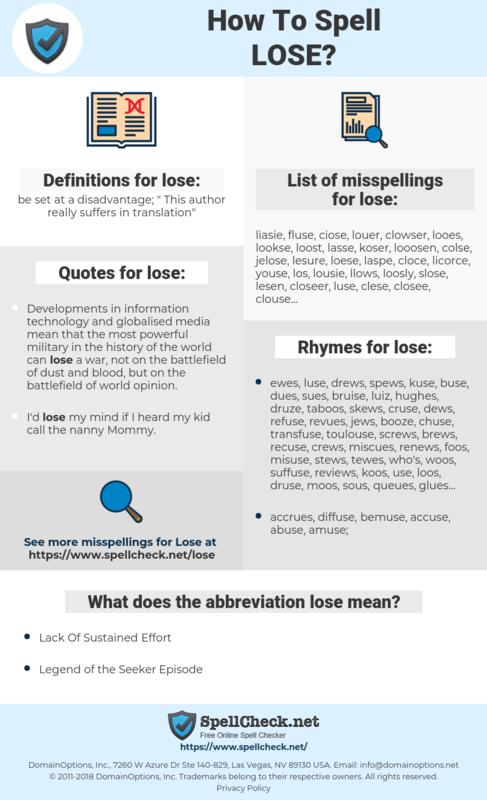 What are the quotes for lose? What are the rhymes for lose? What are the translations for lose? 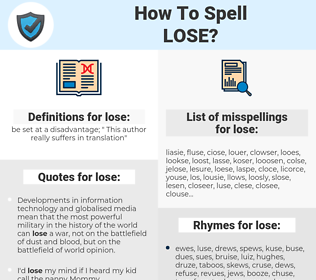 What are the common typos for lose? be set at a disadvantage; "This author really suffers in translation"
This graph shows how "lose" have occurred between 1800 and 2008 in a corpus of English books. 失去, 失, 损失, 弄丢, 失利, 失掉, 输掉, 夺.
verlieren, loswerden, verbummeln, unterliegen, verspielen. 失う, 失する, ロスト, 撒く, 喪う, まける, 敗北る, 擂りつぶす, 敗れる, ほしをおとす, うしなう, 星を落とす, すり潰す, まく, 磨りつぶす, 擂潰す, 落っことす, おっことす, 擂り潰す, 忘失, 磨り潰す, すりつぶす. tracić, przegrywać, zgubić, gubić, stracić. терять, проигрывать, утратить, сбросить, лишиться, избавиться от, потерять.